Fangs, coffins, blood. The story of the vampire has been told for thousands of years and the vampire film itself spans the silent era to today�s blockbusters. Why does our fascination with these creatures of the night never seem to die? 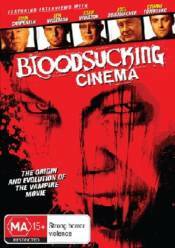 Starring: In this documentary, discover the evil, the eroticism and the legends of �bloodsucking cinema� through interviews that include directors John Carpenter (VAMPIRES), Len Wiseman (UNDERWORLD) and Joel Schumacher (THE LOST BOYS). Actors Kristanna Loken (BLOODRAYNE) and Stuart Townsend (QUEEN OF THE DAMNED). Special effects artists Stan Winston (INTERVIEW WITH THE VAMPIRE) and Greg Nicotero (FROM DUSK TILL DAWN). Writers Marv Wolfman and David Goyer (BLADE), critics Leonard Maltin and Harry Knowles and film clips from the most immortal vampire movies in history.